A three-part analysis of these two major semiconductor stocks reveals which one is the better buy today. Simply put, shares of semiconductor giant Qualcomm (NASDAQ:QCOM) and memory-chip maker Micron Technology (NASDAQ:MU) have completely trounced the market in the past year. At the start of a new year that will bring meaningful changes to each company, which of these two high-flying chip stocks is the better buy? 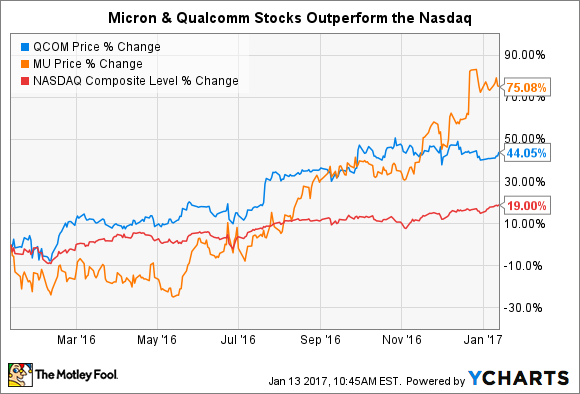 In this article, I will put Qualcomm and Micron stocks through a three-part analysis to see which is the better stock to own today. In looking at their respective measures of financial stability, it's important to remember that Qualcomm's revenue base is roughly double Micron's. Keeping that in mind, a few important differences between the two companies emerge when examining four important gauges of financial strength. Data sources: Qualcomm and Micron investor relations, Yahoo! Finance. A quick scan reveals that Qualcomm easily beats Micron in terms of its aggregate cash, its net cash (cash minus debts), annual cash flow generation, and short-term liquidity. This nearly clean sweep makes Qualcomm the obvious winner in this category, though the important details by no means end there. Importantly, Qualcomm's $39 billion purchase of NXP Semiconductors (NASDAQ:NXPI), which is expected to close this year, will be funded through a mix of Qualcomm's off-share cash and newly issued debt. And though it will certainly benefit the company over the long run, the transaction will dramatically alter Qualcomm's balance sheet metrics in the near term. Qualcomm goes into the transaction from a place of great balance sheet strength, so buying NXP Semiconductors won't jeopardize its financial future. That said, comparing the financial strength of the two companies could produce a far different outcome in coming quarters. As for Micron, its negative net cash position certainly isn't ideal, but it isn't so highly leveraged as to pose any kind of imminent threat to its shareholders. Micron's cash, investments, and annual operating cash flow alone are large enough to theoretically pay down three-quarters of the company's total borrowings. So while Qualcomm easily bests Micron in their showdown of financial prowess, Micron also earns a passing grade in this category. Micron is one of the largest manufacturers of DRAM and NAND flash-memory chips in the world, along with global leader Samsung and SK Hynix. However, the benefits of its market leadership aren't as significant as you might expect, because memory chips are commodity products whose prices are set by market rates. Competition among manufacturers means that achieving consistent profitability can be difficult, as evidenced by Micron's recent quarterly losses. It bears noting that periods during which demand for memory chips outstrips supply can lead to impressive profitability among suppliers. However, the competitive landscape and commodity-like nature of the market means that such periods tend to be short-lived. Thus, Micron sadly lacks much in the way of meaningful durable competitive advantage. Qualcomm, on the other hand, enjoys several strong competitive edges. The most readily identifiable is the sizable patent trove it owns as a result of its leadership in developing 3G and 4G mobile standards. Thanks to these patents, Qualcomm is able to generate royalty payments from every mobile device that is activated around the world. This gives its Qualcomm Technology Licensing division a source of extremely high-margin revenue that represents the majority of Qualcomm's operating profits. It bears noting that Qualcomm's licensing practices have drawn the ire of regulators and handset makers around the world in recent years. Places including the European Union, China, and South Korea have attempted to push back against Qualcomm's IP licensing fees. And while Qualcomm has had to pay some fines along the way, it appears that the legal integrity of its patent licensing practices remains intact, which should enable the company to continue printing profits for years to come. In terms of its NXP buyout, the purchase helps steer Qualcomm's revenue base toward several parts of the semiconductor market, like the Internet of Things, that will underpin the industry's growth for years to come. Finally, examining Qualcomm's and Micron's valuations can help lead to a conclusion as to which name is the better buy. Perhaps as no surprise given the above discussion, the disparity in the two companies' valuations speaks to the differences in the quality of their businesses. As Micron has lost money over the past 12 months, its negative net income means it lacks a usable P/E ratio right now. However, as memory-chip prices are expected remain stable, Wall Street estimates that the company will return to regular profitability in the year ahead. So how do you compare Micron's cheaper, lower-quality business with the stronger but more expensive Qualcomm? One potentially useful way is through the PEG ratio, which factors a company's growth estimates into its valuation. At present, Qualcomm sports a PEG ratio of 1.3, compared with Micron's 9.1 PEG ratio; a PEG ratio below 1 is usually considered as a sign the company is undervalued. As with anything predicated on estimates of the future, the PEG ratio contains some uncertainty. It can be useful, though, in comparing two different kinds of businesses, as we're trying to do here. Which company offers the more attractive overall proposition to investors today? Qualcomm's mix of affordability and sustainable, moderate long-term growth make it the clear pick in my eyes. Micron, and stocks like it, can prove extremely lucrative under the right circumstances. Fortunately for its shareholders, Micron is indeed enjoying one such moment right now. However, when comparing the two companies' ability to produce consistent profits, its business consistency makes Qualcomm the safer pick for long-term investors.